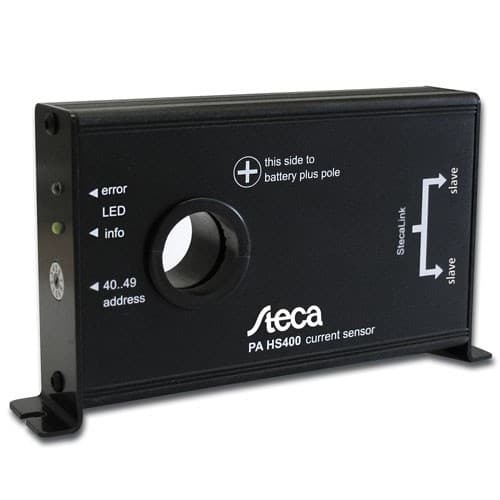 The Steca PA HS400 Current Sensor is a highly intelligent current sensor with extremely low own consumption. TheSteca PA HS400 Current Sensor comes into play when (e.g.) an inverter is directly connected to the battery and the charge controller cannot measure the current consumption. A shunt is also required when an additional generator (e.g. PV, wind or diesel) directly charges the battery. The current is measured contact-free via a Hall-effect sensor. The data is transmitted to the charge controller over a cable connection. All types of current flows can be detected: charge current, load current and battery and DC-side inverter current flows. The Steca PA HS200 has been developed for applications with the Steca Power Tarom. The PA HS400 can be used exclusively with Steca Tarom MPPT 6000-M and Steca Tarom 4545/4545-48.